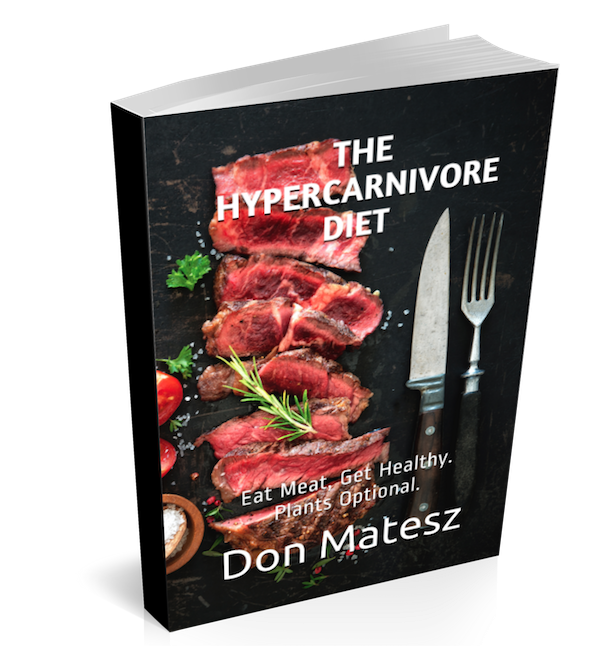 The Hypercarnivore Diet: Does Doug Brignole Know Squat Physics? Does Doug Brignole Know Squat Physics? He has written a number of articles on biomechanics and apparently plans to release a book entitled The Physics of Fitness. Apparently this book has received very positive advance reviews from such luminaries as Wayne Wescott, professor of exercise science and advocate of high intensity training, Jeffrey Mackey, professor of physics, sports psychologist Fred Hatfield, and neurobiologist Stephan Guyenet, among apparently well qualified reviewers. I have found some value in some of Brignole's articles. 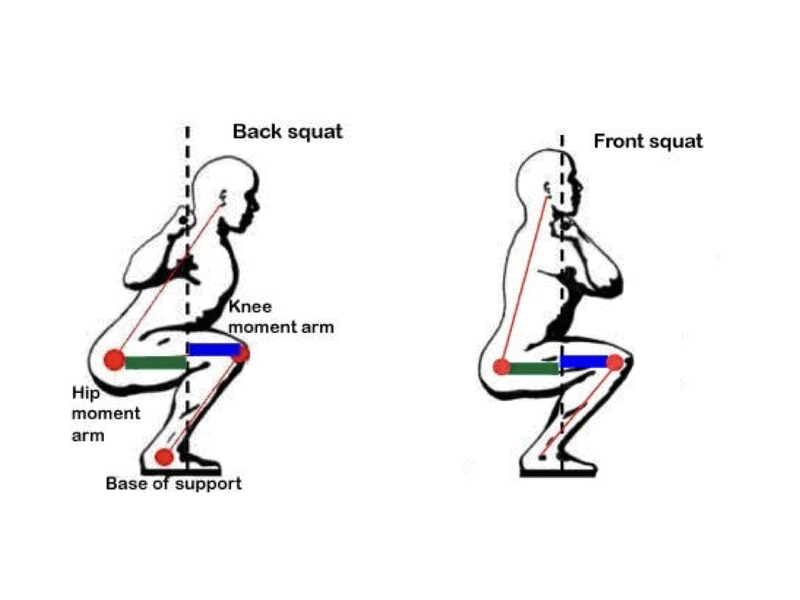 However, in an article entitled “Do You Know Squat” Brignole makes some claims about the physics (mechanics) of squatting that reveal that he probably does not understand some important aspects of the basic physics of squatting. I will need to extensively quote this article in order to explain where he goes awry. “A lever that is parallel with the direction of resistance is 'neutral.' It provides zero load to its operating muscle. A lever that is perpendicular with the direction of resistance is maximally active. It provides 100% of the available resistance to its operating muscle. A lever that is in positions between parallel and perpendicular are percentages between zero and 100. 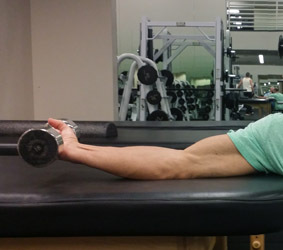 “What you’ll notice is that regardless of the weight you have in your hand, it does not require any force from your biceps, to maintain your forearm in a perfectly vertical position. This position is parallel with gravity - so it's neutral. This is the reason why light posts are vertical, as well as most support beams under bridges and in buildings. So far, Brignole is correct. From here he goes on to discuss the mechanics of squatting, where he starts making errors. “In the photo above, we see a man in the descended position of a Squat. The red line indicates 'vertical', and is where the man’s lower legs, upper legs and torso would be, in the upright position. When in the upright position, the lower legs, upper legs, and torso are all in the neutral position - parallel with gravity. “Now that he’s in the descended position, we can see the angle to which each of these three levers (lower leg, upper leg and torso) have moved, from the neutral position. “The lower leg is at about a 60 degree angle, the upper leg is just below the horizontal position, and the torso is at about a 58 degree angle." Its important here to note that Brignole is describing the angles of the lower leg, upper leg, and torso relative to the ground. This plays a role in his error. “It’s important to note that since none of these levers are perpendicular (in the descended position), none of them are neutral. They are all 'active' now (in this descended position), to varying degrees. “The most 'active' is the upper leg (lever) - since it’s horizontal (perpendicular with the direction of resistance). It is being operated primarily by the Glutes. I bolded the last sentence because this is where he reveals a misunderstanding of the physics of squatting. He claims the lower leg is loading the quadriceps with less than half of the available resistance. Since he implies that the lower leg is loading the quadriceps, but with less than half of the available resistance, I say he is "not even wrong" because in fact the lower leg is not providing any load to the quadriceps at all. Let me repeat: the lower leg is transmitting no resistance whatsoever to the quadriceps, and this does not mean that the quadriceps are not subjected to a load. First, just look at the photo. There is no load attached to or force being applied to the lower leg anywhere. Even if there was a load attached there, it would make no difference to the quadriceps. When people add resistance to squats, they attach it to the shoulders or hips, not to the shins or ankles, because attaching a load at the shins or ankles will not make squatting more difficult. The quadriceps are not resisting a load transmitted through the shin! In writing "The lower leg (lever) is operated by the Quads..." Brignole gives the impression that he believes that the quadriceps can only operate (move) the lower leg lever. In fact, since the quadriceps attach to both the lower leg and the upper leg, they can operate either the lower leg or the upper leg (femur), depending on which lever (bone) is anchored and which is free to move. In a seated leg extension (a so-called open chain movement), the femur is anchored and the lower leg is free to move. When the quadriceps contracts, it pulls on the lower leg to open the knee joint into full extension where the tibia aligns with the relatively stationary femur. In contrast, in the case of squats (a so-called closed chain movement), the feet are anchored to the ground by gravitational and friction forces, limiting the lower leg to about 30º of motion, while the upper leg is free to traverse more than 100º of motion. As a consequence, when the quadriceps contract, they will primarily move the loaded and most active lever, i.e. the upper leg (femur). If this is not obvious to you at this point, I will prove it shortly when I discuss vertical shin squats below. From Johnston BD, Prescribed Exercise. However, if you try vertical shin squats, you will find that the quadriceps in fact bear the brunt of the resistance, that the resistance to the quadriceps contraction is far greater than with a conventional squat, and that the quadriceps (not the gluteus) will be the limiting factor in this exercise. Let me explain where Brignole went awry. In the photos above, where he shows that the biceps bear no resistance when the forearm is resting perpendicular to gravitational force, the load (dumbbell) is resting on the end of the lever and its force is being borne by the lever (the forearm bone). Hence, the biceps do not need to exert any force. Brignole apparently erroneously interprets this as evidence that if any bone is perpendicular to the ground, no muscle attached to that bone can be under load. 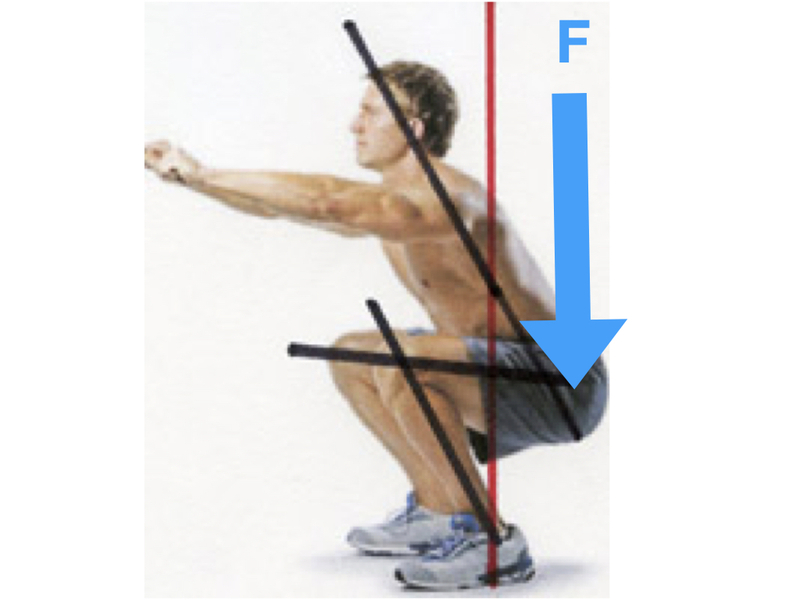 In contrast to Brignole's forearm/bicep example, in squatting, the load is not balanced on top of the knee (to be supported by the shin), but is applied to the end of the femur opposite to the knee. 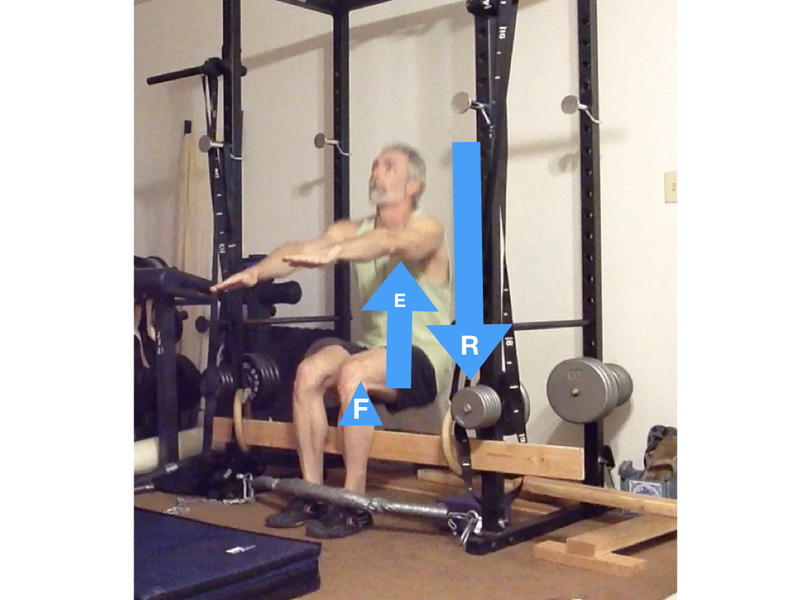 In squatting with fixed vertical shins, the upper body (plus any additional load) is the load which through the active lever (femur) is converted into resistance (R). The shin is indeed parallel to the line of resistance, but the load is not balanced on top of the shin bone. The load of the upper body is driving the proximal end of the femur toward the ground. The knee is the fulcrum (F) for the lever (femur). The effort (E) opposing the resistance is provided primarily by the quadriceps pulling on the femur to oppose the closing of the knee (eccentric) or to open the knee and bring the femur into alignment with the tibia (concentric). In comparison to the regular squat, the vertical shin squat places MORE, not less, load on the quadriceps because it lengthens the lever arm (distance from fulcrum to resistance). To understand why, you need to understand moment arm. The moment arm is the distance between a fulcrum and the line of resistance. 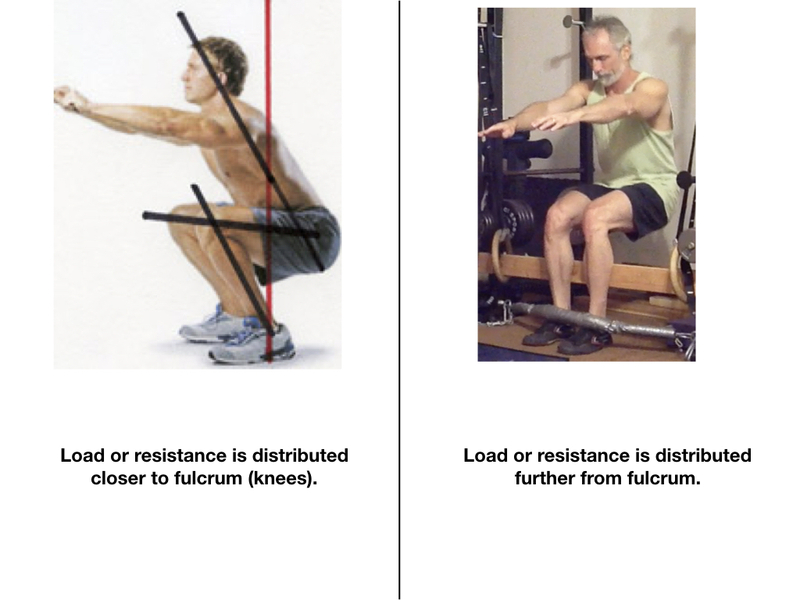 The figure below contrasts the knee moment arms (Mk) and trunk (should be hip) moment arms (Mt) of back and front squats. Typically a back squat has a longer hip moment arm and a shorter knee moment arm than a front squat, which means that in a back squat the hip extensors (glutes) do more work and in a front squat the knee extensors (quadriceps) do more work. With a normal squat, the body (and barbell) leans forward, which both a) lengthens the hip moment arm, which increases the load on the gluteus, and b) shortens the knee moment arm by distributing the load closer to the knee fulcrum. With a vertical shin squat the load is kept further from the knee fulcrum, lengthening the knee moment arm and greatly reducing the hip moment arm to near zero; this results in much less resistance applied to the gluteus and much more resistance applied to the quadriceps. 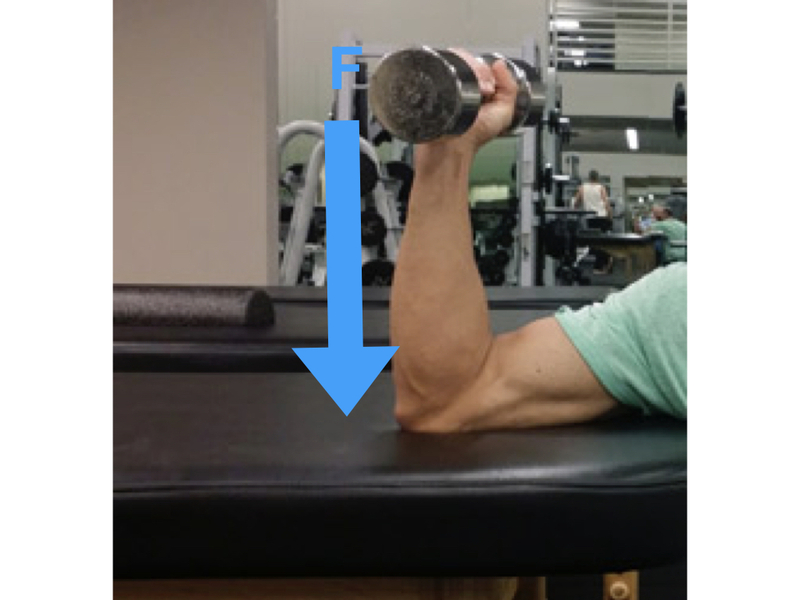 The increased length of the lever arm (knee to hip, about 16-20") magnifies the load provided by the upper body (and any additional load). This is why I can do 10 deep and paused barbell squats with an additional load (barbell) of more than 150 pounds, but can handle only my body weight for 10 repetitions of the vertical shin squat. To reiterate, Brignole appears to believe that anytime a limb is vertical (parallel to the force of gravity), the muscle(s) that can move that limb must be more or less inactive and any load applied to the system must be borne through that vertical limb bone. Specifically, he appears to believe that his bicep/forearm example proves that if one squats with shins vertical, the quadriceps will "get little if any resistance." This is incorrect, and reveals that he does not understand the mechanics of squatting. 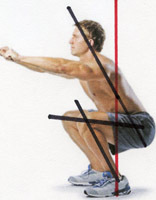 He also appears to allege that in squats, the shins are delivering some resistance to the quadriceps. This is incorrect. He appears not to understand that the load on the quadriceps is being transmitted via the femur, not the shin, through a third class lever action. He also seems to not understand that every muscle that crosses a joint can act to move either lever to which it attaches, depending on which lever is anchored. He appears to believe that the quadriceps can only move the lower leg. In fact, the quadriceps can move either the lower or upper leg, depending on whether the lower or upper leg is more fixed. If the upper leg is free to move but the lower leg is fixed (vertical shin squat), the quads move the femur to extend the knee. If the lower leg is free to move but the upper leg is fixed (leg extension), the quads pull on the tibia to extend the knee. If Brignole's forthcoming book The Physics of Fitness incorporates the same arguments he makes in this article "Do You Know Squat" then I am surprised that people who should understand physics have given it glowing reviews. In a future post I will examine claims Brignole makes about parallel bar dips. 1. 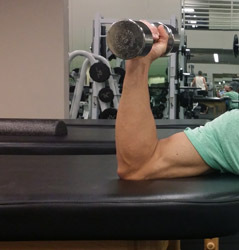 The bicep example you provide is a 2 lever system. The squat is a 3 lever (back, femur, lower leg, and I would argue it's a 4 lever system as the ankle and foot is involved because it controls the other end of the lower leg lever). 2.The back is also a lever - the big one. 3. You state "the load is not balanced on top of the knee (to be supported by the shin), but is applied to the end of the femur opposite to the knee..." and I take that to mean the hip joint but the load is balanced by lower leg/shank & ankle joint/foot. 3. By PTDirects own drawing one can clearly see the levers involved AND each lever PROPORTIONALLY takes a share of the weight - the back lever (spine) lever/hip joint BY FAR takes the brunt of the weight as the joint angles close during the squat movement downwards. 4. Also by the PTDirect image, the femur lever is greatly affected (shortened) by the lower leg/shank lever as the eccentric move downwards begins. 5. So when Brignole states the quads only receive a fraction of the force/weight, and that weight is representative of the angle closure of the lower shank, he is absolutely correct. The PTDirect image proves this and the back/spine and hip joint bears the majority of the weight during the movement. The femur lever/quads only receive a fraction of the weight due to the weight bearing shank lever.